Another dinner that is quick to put together on a work night. Grilled Burgers with Homemade Fries and the Buns were also homemade, baked the night before. I used this recipe for the Hamburger buns seasoning this time with fresh chives. But they are also wonderful with fresh Rosemary. Now that looks wonderful! I really should try making buns again. I wasn't happy last time at how the recipe I used came out. Will have to go look at your recipe. I made those rolls because of you..I am certain it was you. I still enjoy my burgers and fries.. but always at home. Beautiful buns you have Ann! I must try this recipe! Mmmm, I love sandwiches and your heavenly potato rolls would take any ingredients to a whole new level. I'm not much of a bread baker but I'm giving this recipe a try. Fabulous idea pairing the potato rosemary rolls with that gorgeous patty for a fantastic burger! 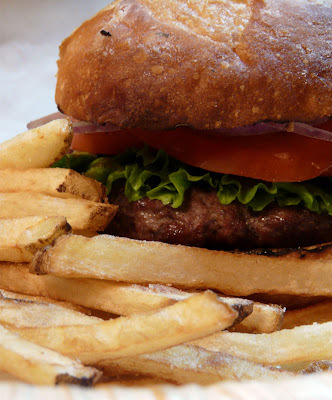 Burger and fries is a perfect meal. 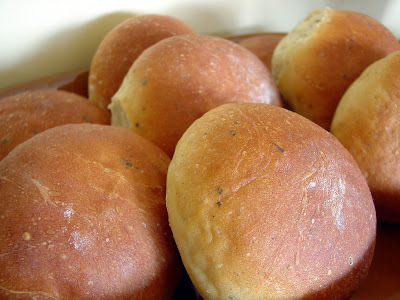 I especially love the idea of home-made buns.